The greyhounds have made history! Amendment 13 has passed on the ballot by a margin of 3-1 and Florida has now become the 41st state to prohibit the cruelty and killing of dog racing. Eleven of the 17 dog tracks remaining in the United States will close as result. Read our timeline to victory. This happy ending is due to the tens of thousands of people who have worked for years to speak for the dogs. We would especially like to recognize the contribution of Kathy Pelton. She learned what was happening to dogs in her state and set out to help them. 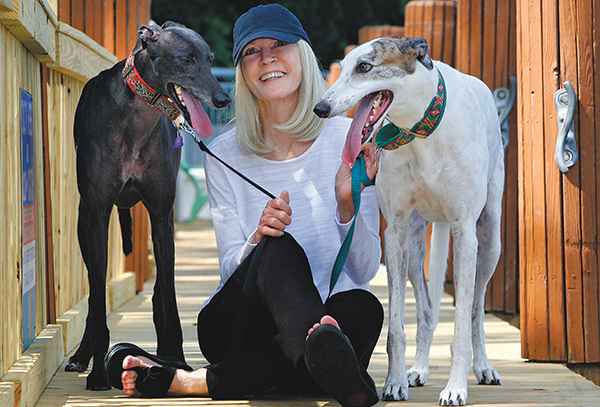 As our Florida director, she hosted outreach tables, led rallies, walked in parades, raised funds and gave the greyhounds everything she had until passing away last year. Kathy, this one’s for you! Click here to read more about Grey2kUSA and the amazing work they have accomplished. Governor John Carney signed HB 235 into law to protect free-roaming cats in Delaware. The law states that free-roaming cats deserve the full protection of animal cruelty laws and that shelters have the full protection of the law to implement return-to-field programs. It will also protect caretakers who manage colonies of free-roaming cats. This bill, which was nearly two years in the making, was a collaboration between Best Friends Animal Society, Brandywine Valley SPCA, Faithful Friends Animal Society, Delaware Humane Association, Forgotten Cats of Delaware, the Office of Animal Welfare, the veterinary community, the wildlife community, and the public. The passage of HB 235 is considered a big win for free-roaming cats and caretakers in Delaware and will help save more lives. The new law will humanely and effectively reduce the population of free-roaming cats in our communities via shelter-based sterilization and vaccination programs. This science-based, veterinarian-focused approach to population control has shown itself to be the only effective means of reducing the numbers of free-roaming, unowned cats. The bill also adds protections to ensure that animal cruelty laws apply to all cats, whether they’re owned or not. The law also gives animal shelters the needed flexibility to implement programming that will help them save lives and adopt more animals. By exempting animals participating in a cat sterilization return-to-field program from the typical “stray hold” period, shelters won’t have to use their extremely limited space to house cats they know have no owner and are not candidates for adoption. This frees up cages and resources that can then be used to find homes for other adoptable cats and dogs. This will have a direct impact on the number of animals leaving shelters alive. The bill also brings needed record-keeping to shelters regarding free-roaming cats. Over time and with a large enough sample size, animal advocates will be able to track the success of each shelter’s return-to-field program. That information can help shelters direct resources to the programs that are most helpful at achieving their mission of saving animals and finding homes for adoptable pets. We feel it is necessary to make a statement about the incident of the two dogs allegedly hit purposely with the police vehicle with one shot dead. We have received many calls from the community upset about the handling of the situation which resulted in a tragic outcome. Citizens have expressed their deep concern, specifically about the use of deadly force by officers instead of life-saving work for these stray or abandoned dogs from the animal welfare agents already present at the scene. We only have the story outlined in the newspaper and we may be missing some of the facts. Therefore, for the purpose of accountability, we ask for a full investigation of the incident so that citizens have the facts and that appropriate corrective actions can be instituted by the City of Newark to prevent future unnecessary deaths of stray or abandoned animals. It appears to us that the officers have not received proper training to deal with these situations in the most humane and effective manner. If the officers had been properly trained, they may have realized that the dogs were most likely behaving aggressively out of fear. The idea that dogs who bark or lunge, and have behaviors which appear aggressive, are ‘dangerous’ is not always an appropriate conclusion for abandoned or stray dogs who are often scared for their lives and safety. We learned that every year in the U.S. over 10,000 dogs are killed by police. We know that police officers have difficult jobs and that they face many dangerous situations. However, we believe proper training in animal care and control can prevent unnecessary killings. Dogs are family. Dogs have rights to be treated humanely. Likewise, officers deserve the tools they need to do their jobs safely, effectively, and humanely and with accountability. Sadly, one dog needlessly lost his/her life and another was injured. We are pleased to learn that the second dog who was secured is recovering at Brandywine Valley SPCA. Ask that nationally recommended training and equipment be provided for the City of Newark Police, City of Newark Animal Care and Control Officers, and the State Office of Animal Welfare Officers so they are better prepared to handle abandoned or stray dogs in these situations in the most humanely way possible. Ask that funding and similar training be provided for police across the state who may be involved in supporting animal care and control, including State and County police and municipalities such as Dover (which like, Newark, have their own animal care and control teams). Thank them for hearing your concerns. On Monday, USA Today’s editorial board published a fantastic editorial lambasting the King Amendment, and King himself published an editorial in response. ACTION NEEDED – TIME SENSITIVE: Please help keep the King Amendment out of the Farm Bill by writing a short letter (under 200 words) to USA Today’s editorial board, thanking them for taking a stand against the King Amendment and explaining why you oppose this reckless assault on animals, consumers, and states’ rights. See the example letter below for more information and inspiration for your own letter. Make sure to include your full name as well as your address and phone. Thank you so much for your help! Thank you for speaking out against Rep. Steve King’s latest attack on animals, consumers and states’ rights. (“Needlessly Killing Kittens and the Horrible Hundred”) King’s proposed amendment to the farm bill could overturn thousands of important state and local laws, including laws governing animal welfare. These laws were democratically enacted to address important local concerns and should not be overturned en masse by a fringe politician in Iowa who wants to score points with his Big Ag benefactors. Thankfully, over 120 bipartisan lawmakers and over 200 public interest groups vocally opposed the King Amendment before Congress rejected the farm bill outright. To protect consumers, animals, and states’ rights, our federal lawmakers must now ensure that this odious measure stays out of the farm bill for good.